Not to continue beating a dead horse, but I have a stick and the carcass is right in front of me. The entire supply chain inside the US economy is full agreement both on where the economy is right now and, perhaps more importantly, how it came to be that way. Such harmony is not atypical, as synchronicity usually defines the hard edges of any cycle. This, however, is something else entirely, especially as it stretches back years and confirms we are witnessing nothing like the usual. As it is, this latest part or phase or whatever has already taken up nearly two years. 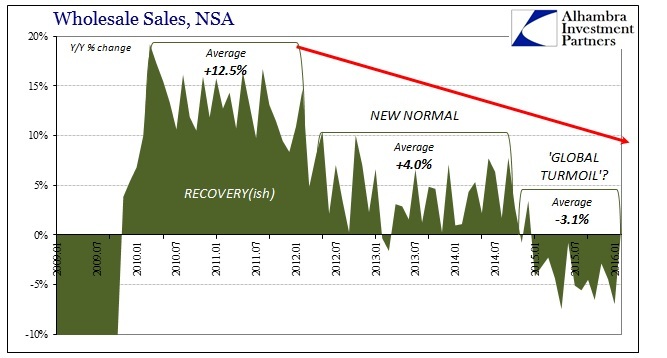 In terms of wholesale sales, as noted this morning, overall sales peaked in July 2014 – meaning nineteen months (thru Feb 2016) of deceleration into sustained contraction. 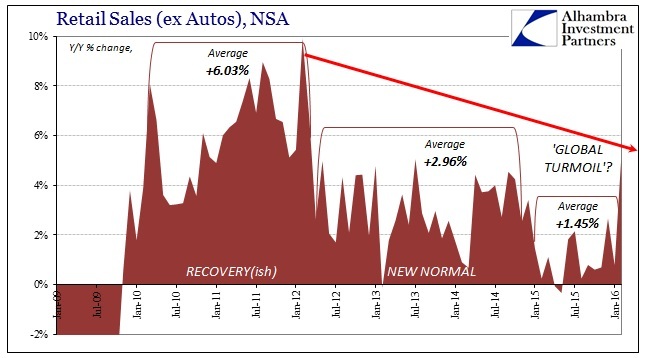 Worse and what is probably the most concerning is that after those nineteen months inventory is only just now starting to correct, and it is doing so ever so gently. That suggests again slowdown without yet any visible end. In that sense, recession might actually be the best case since it would greatly speed up the affair in at least the convergence and reversion of inventory to sales (though that would still leave questions about the economic trend after it). By comparison, the Great Recession featured just nine months of contraction; the whole of the dot-com recession twelve. Those were both top to bottom, peak to trough, over and done with. In 2016, we are very likely facing two years and still only the beginning of reconciliation or balance, and no idea what that might mean further down in wider economic feedbacks and negative multipliers. One other noteworthy interpretation: to find the “goods economy” including the whole of the supply chain in such joined, steady dislocation cannot be anything but a negative comment on the whole of the economy, services included. That starts with the fact that a significant portion (as much as half) of the “services economy” directly addresses the “goods economy” (retail, wholesale, transportation, etc.). 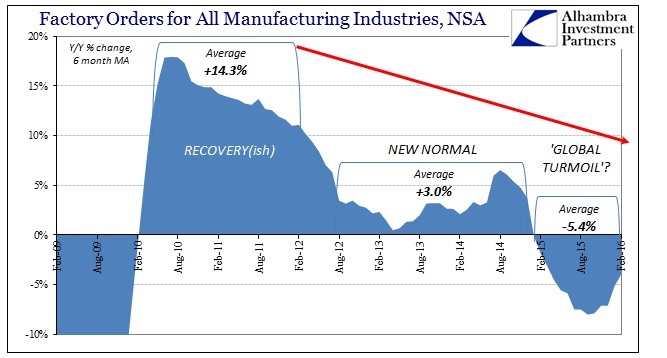 Beyond that, if there is total breakdown in growth and advance in goods that can only mean a serious problem with US consumers. It has already forced economists and policymakers to completely abandon what was in late 2014 and early 2015 inarguable recovery and success. Just because it has not, so far, acted like recession does not propose a clean bill of health (just like it did not, last year, recommend this was all some temporary slump worthy of nothing but dismissal). Instead, that it has continued on for so long suggests quite the opposite, and, again, likely worse than just recession prospects in the long run.